We’ve been staycationing this week, staying at Ed’s sister’s place in the Cotswold Water Park doing our usual summer stint of gerbil sitting. Although I have been having a break, I have been doing some work, but trying to keep everything really simple – throw something on the BBQ and serve with a green salad and glass or two of prosecco, then follow up with a bowl of strawberries, cream and a good scoop of ice cream. Simple, fuss-free but delicious. I had an epiphany this week, and discovered that I have been cooking pasta wrong for all of my life. Pasta, as anyone will tell you, is a simple thing, boil up a large pot of water, throw in some salt and a few drops of oil, add pasta, make a pasta sauce, you know the routine. 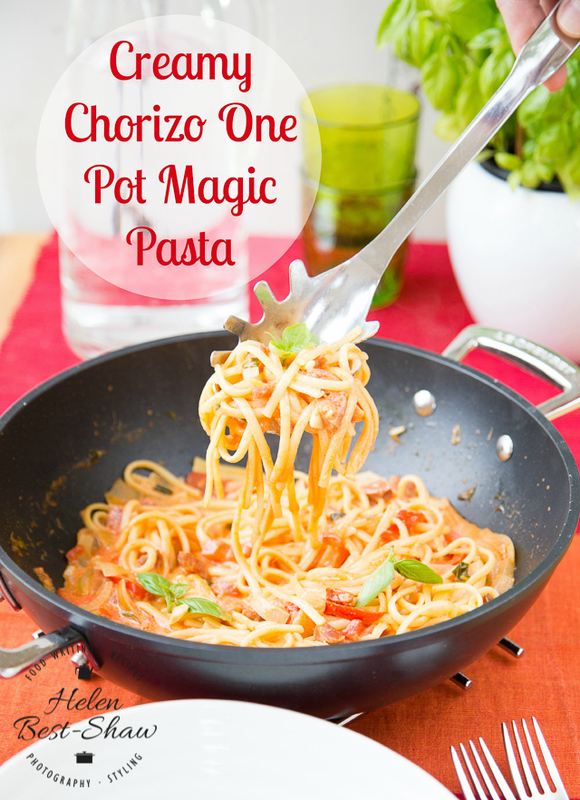 This week I discovered the life changing one pot magic wonder pasta! 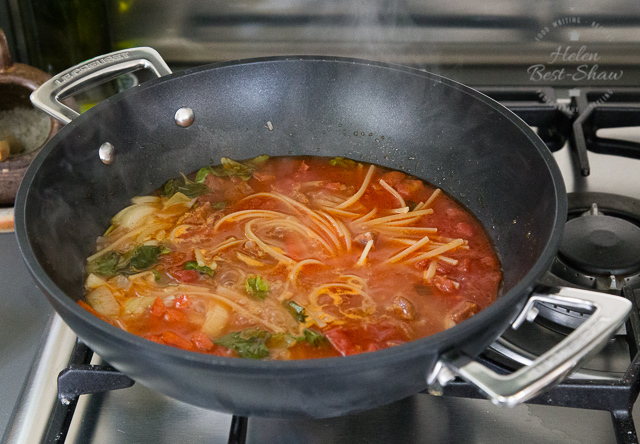 Simply add all the ingredients for the pasta and sauce to a pot and simmer until the pasta is done! It is the perfect one pot dish, the starchy pasta water makes a lovely silky smooth rich creamy pasta sauce and the only washing up is a chopping board, pasta pan, knife, serving bowls and cutlery, and the prosecco glasses, of course. I was skeptical about not frying the onion, but it really does not need to be cooked first, simply layer in all the ingredients, cover with stock, cover, bring to a simmer. I used my used my new Le Creuset Toughened Non-Stick wok to cook the pasta in, it is robust, but lightweight, has two handles rather than one long one, and a snugly fitting glass lid (see my recipe for caramelised onions in the Le Creuset wok, and spaghetti frittata in the Le Creuset frying pan). Once the pasta has softened give the mix a good stir and cook until the pasta is nearly done and the liquid absorbed, stir in a spoon of goat’s cheese and voilà! Dinner is served in 20 minutes with minimal washing up. Quick, easy, adaptable and fuss free this is my new to go dish for a speedy weeknight supper. If you try this Creamy chorizo & goat’s cheese one pot magic pasta please tag #FussFreeFlavours on Instagram or Twitter. It is amazing for me when for me when you make one of my recipes and I really do love to see them. You can also share it on my Facebook page. Please pin this recipe to Pinterest too! Thanks for reading Fuss Free Flavours! 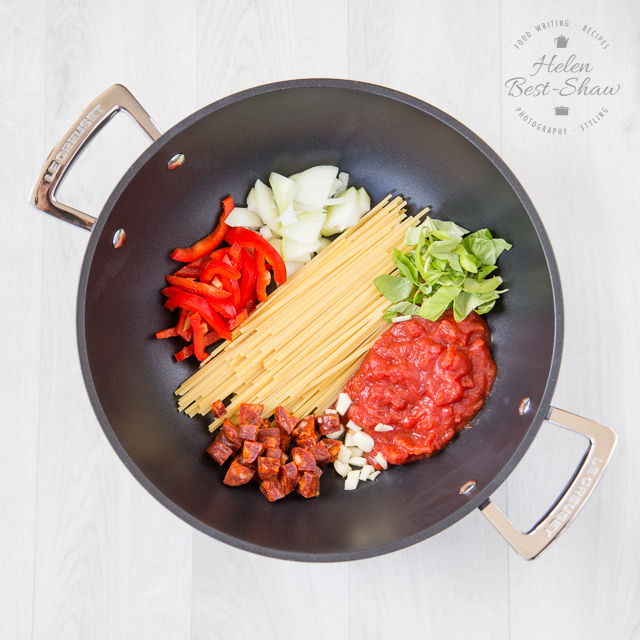 The one pot magic method is only way to cook pasta! 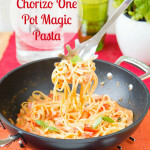 An easy recipe for a creamy chorizo & goat’s cheese pasta everything cooks in one single pot and is ready in 20 minutes. The starch in the pasta cooking water makes a silky smooth creamy sauce. 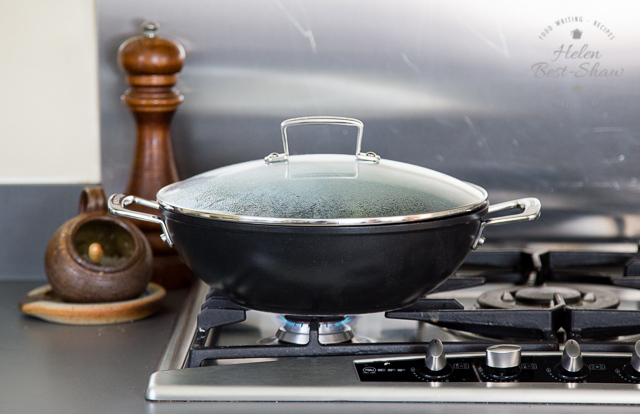 Place all the ingredients apart from the goat's cheese and lemon into deep frying pan or wok with a snugly fitting lid. Slowly bring to a simmer. Once the pasta has softened stir well. For the last few minutes of cooking remove the lid, stir in the cheese and a squeeze of lemon juice to lift the flavour and season to taste. Serve with a sprinkling of freshly grated Parmesan. The amount of liquid needed will vary according to the type, shaped and cooking time of the pasta. As a guide for 170g / 6oz you will need 500ml (2 cups) or liquid and 1/2 a cup of wet vegetables.